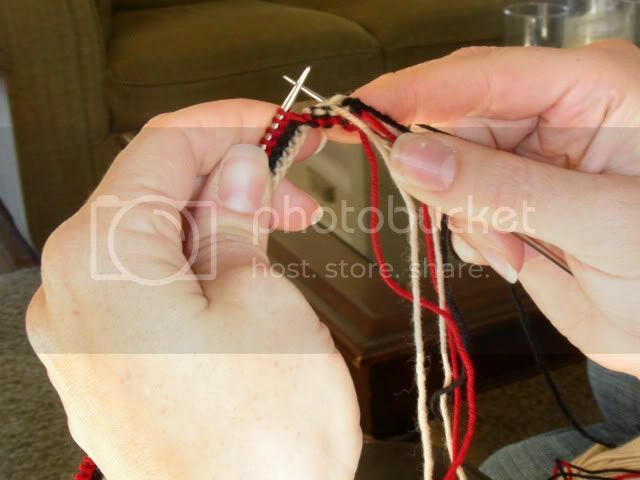 How to make a Latvian Twist cuff. I think this is a beautiful detail on socks, and would look equally as lovely on gloves or a hat. For this particular project, I am using 3 colours and a knit 4 twist repeat. 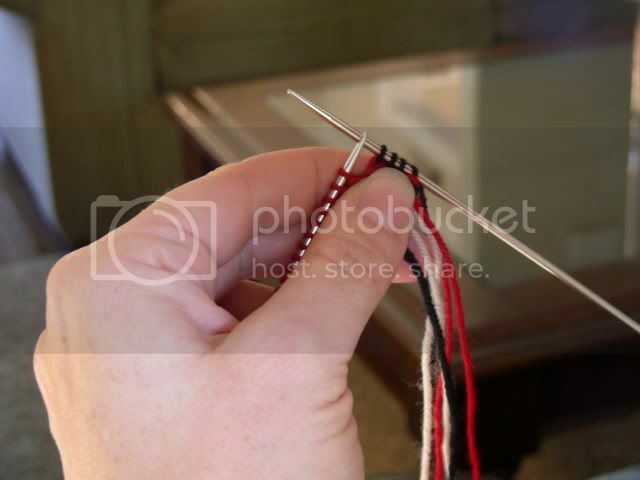 You could use whatever colour combination and make your twist longer with more stitches knit inbetween, or shorter with less stitches knit inbetween. The cuff is worked back and forth on long needles (or circs) then switch to your double pointed needles or magic loop and join in the round. With main colour, knit 2 rows. Using a CC2 knit 2 rows. and end back at your knitting position. 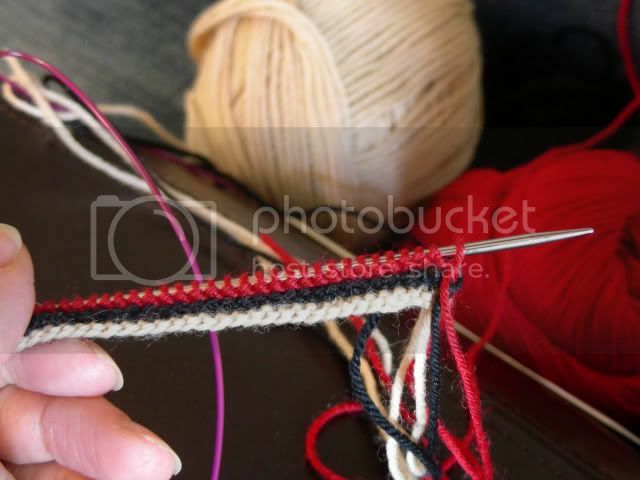 Continue knitting with main colour. Knit 4 stitches and rotate again as above. Complete the steps across the entire row and voila! Latvian Twist complete! Now, using your main colour and working magic loop or on double pointed needles, join your work for working in the round and away you go! This is really pretty. I'm definitely going to try this on a future sock project! Thanks! Very Cool. Thanks for the pics. I now realize what I'd been doing wrong in a long-abandoned-due-to-frustration project. How neat!!! What a great trim on gloves/mittens or even a sweater bottom/cuffs! Beautiful! It seems so simple (of course, I could probably never have figured it out), but it looks so lovely and complex. My goodness, there is something new all the time. I love that technique! Thanks for sharing it. So simple, yet so lovely! Thanks for showing us! That's amazing! I'm so glad I found your blog. I love it and can't wait to see the completed sock. Thanks for the tutorial, I'm definitely going to try this. The braid looks pretty-- but does it feel at all lumpy when you wear it? So cool! Thanks for the tutorial! I love that you work it back and forth...the bonus is joining to knit in the round is much easier and less fiddly. Very cool, and oh so simple! Now that is dead cunning! 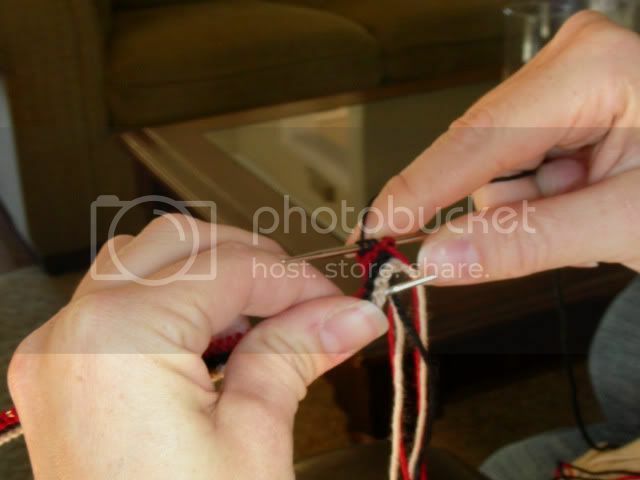 One question, do you loose much length in your cast on because of the twisting? It really is beautiful. Very neat! I've never seen that before; I can't wait to try it on something. What a neat technique! I love doing things that look complicated, but are actually quite easy. (I think making quiche falls into this catagory.) Thank you for sharing this! Thank you, thank you! I always learn so much from visiting your blog. A great technique so beautifully taught! Wow. That's really cool. I'll have to try that on something. Thanks for the great pictures. A great graphic illustration of Nancy Bush's instructions from Knitting on the Road. Thanks! You make that look so easy, clearly a photo is worth a thousand words! 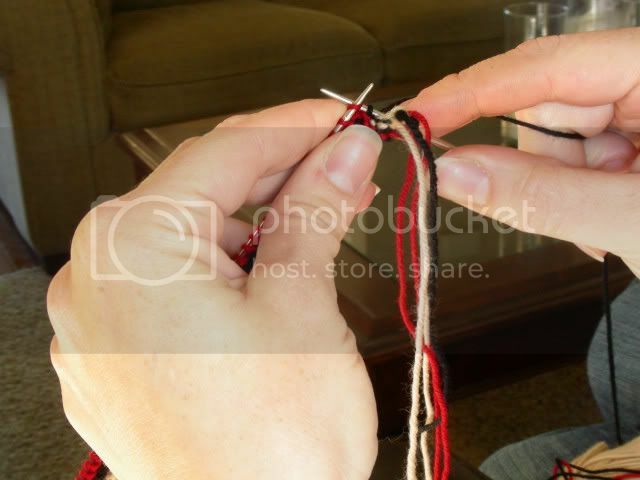 I plan to take a latvian mitten class in November and this gives me a head start. Thank you!!!! Thanks for the tutorial. That looks like an awesome cuff. Click! My brain just registered what that instruction means! Thank you. Now, I need to go try it out and see how well it clicked. That's so clever! Thanks for the demo. I sw this yesterday and wow, C, thank you so much for putting it together. It is great for a number of things. I will definitely link to it during the tutorials week of Socktoberfest ;) Amazing! Thank you. Do you have any tips for connecting it in the round so it is as unnoticeable as possible? This was super helpful. Have you always wondered how to make those cool resin pendant featuring your own embedded photos or other objects? Then check out my step-by-step resin beads and pendant making project, and learn how to make resin beads today! I am also featuring several resin jewelry designs using components from the "Fresh" brand, available at Michael's Crafts stores. These resin cabochon are bright and fun, and best of all--inexpensive! Given the price of metal and resin beads these days, resin bracelet is a fun alternative to try when you want to make something unique and creative without spending a fortune.